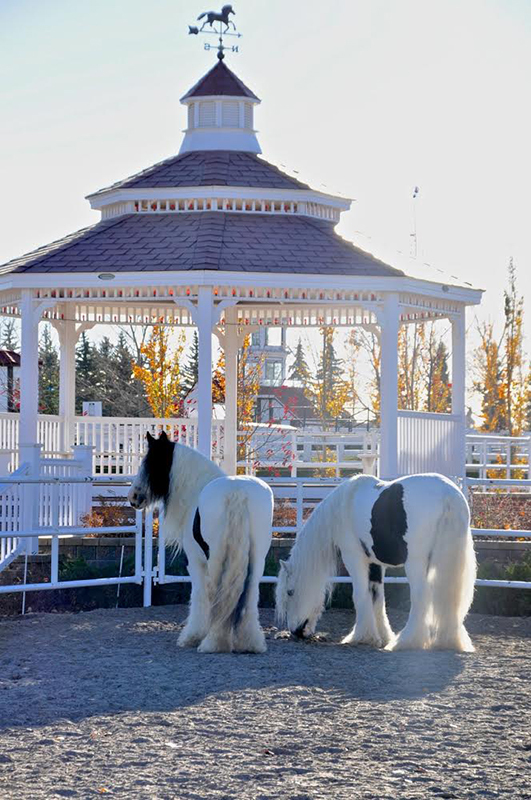 This page is dedicated to following the adventures of Lioness and Tully as they start their journey with Spruce Meadows in Calgary Alberta, Canada. 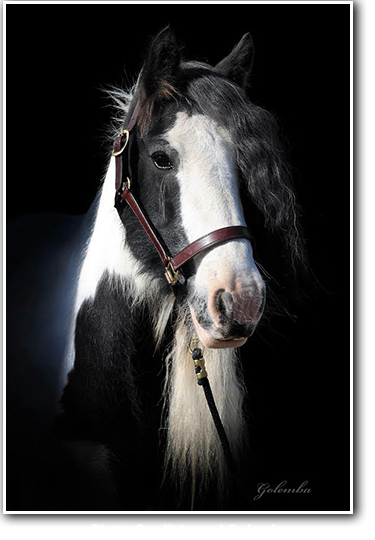 Pictures and articles or links will be added as we follow them in their new careers with the world-class Equestrian Centre. 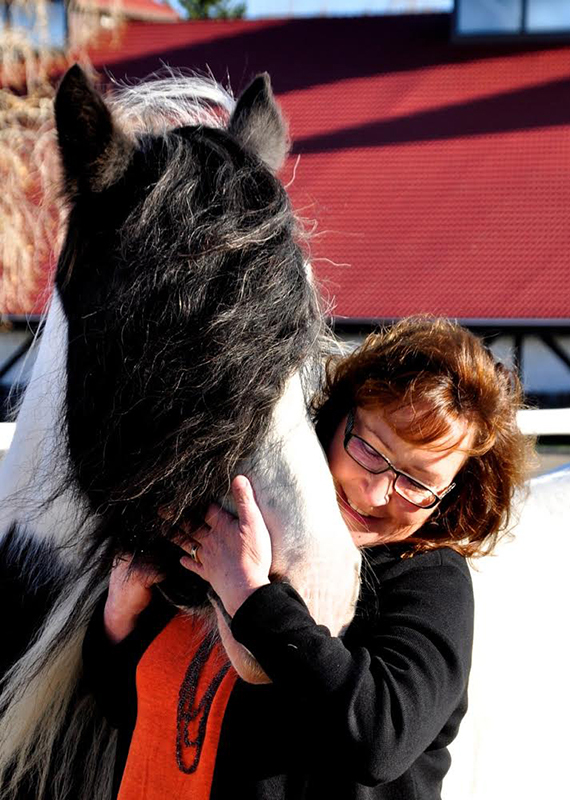 It is a great pleasure to introduce the newest member of the North Fork Gypsy Cobs family, Linda Southern-Heathcott, President of Spruce Meadows in Calgary, Alberta, Canada; the world-renowned Equestrian facility,which draws more than 5000 competitors and over 500,000 spectators to its show jumping tournaments and events every year. 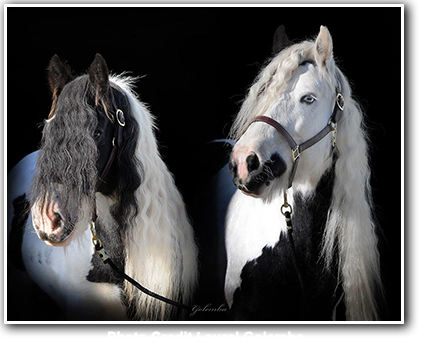 North Fork first began turning heads at Spruce Meadows when they decided to exhibit and show their Gypsies for the very first time at the Breeds of the World exhibit in 2009. 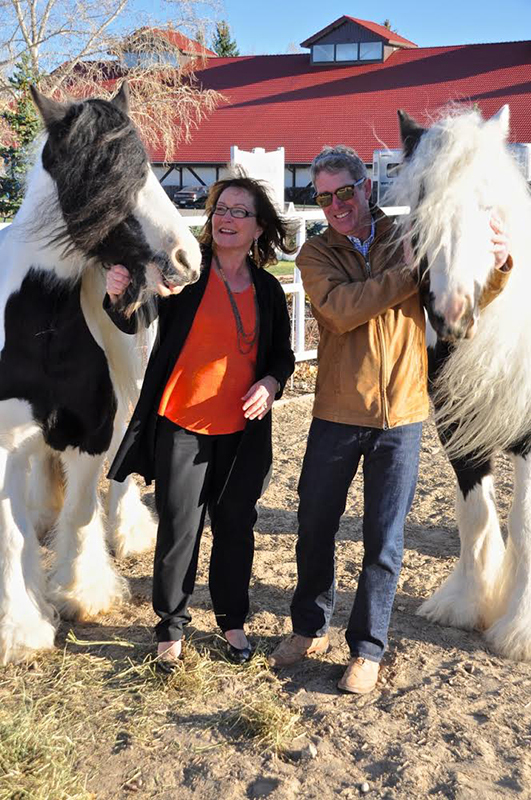 Spruce Meadows staff welcomed North Fork owners Dale and Cheryl Nygaard, along with their trainer Wendy Walker, forging an ongoing respect for this world-class organization. 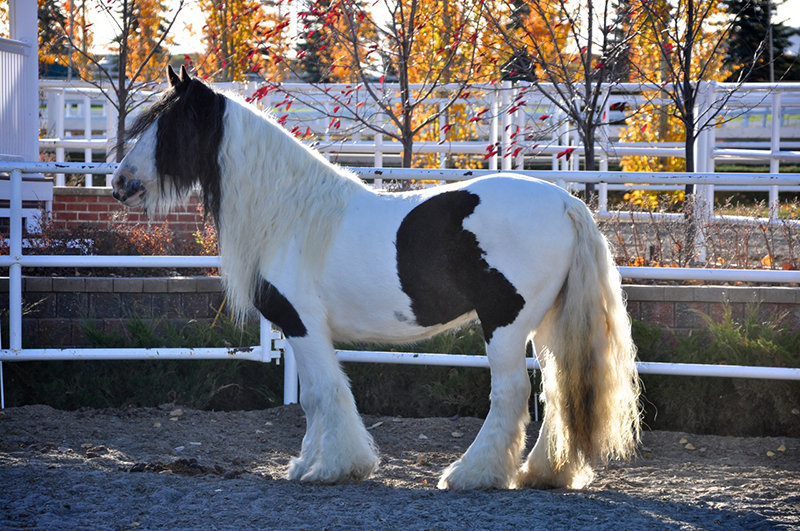 Over the years, North Fork’s horses continued to be involved in events at Spruce Meadows including the prestigious TELUS Battle of the Breeds, where Team Gypsy Vanner won Fan Favorite in 2014. 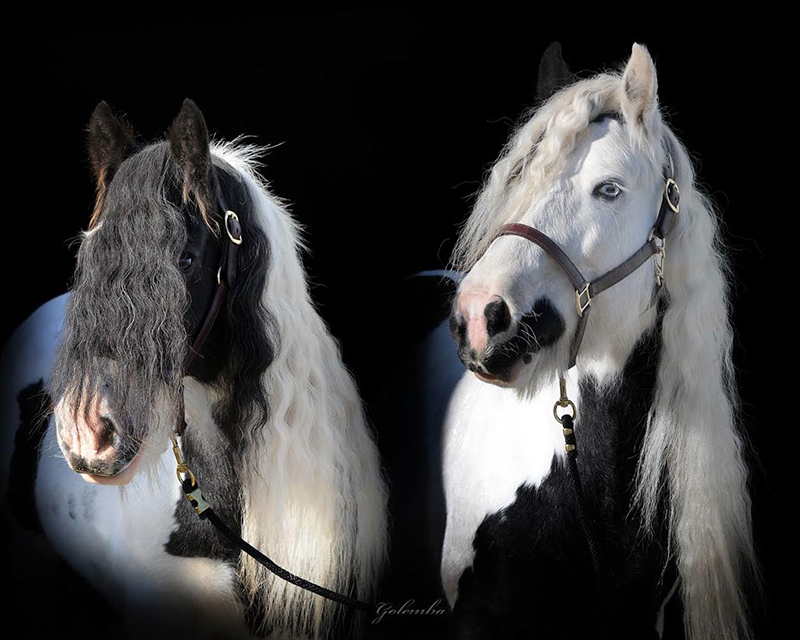 Soon after returning home from the 2014 Battle of the Breeds, Dale and Cheryl were both honoured and shocked to received a formal request from Linda Southern-Heathcott, who wanted to purchase two North Fork Gypsy Cobs for use as a driving team and to showcase as representatives of this very rare breed. In further discussions, Spruce Meadows expressed interest in purchasing both Tully and North Fork Cash, but in their quest for a matched driving team, they selected Tully and North Fork’s top breeding mare Clononeen Leona (Lioness). 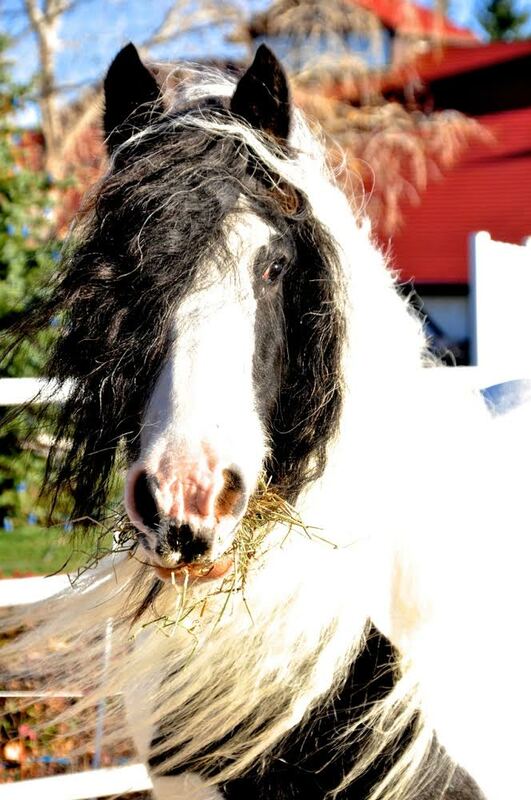 As one of North Fork’s foundation mares, Lioness’s kind and dignified personality along with her amazing masses of mane, tail and feather made her the obvious choice for a teammate to Tullamore Dew. 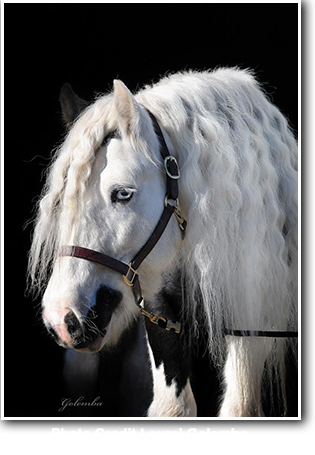 Tully, one of the foundation stallions of the North Fork Gypsy Cobs breeding program has always been a show stopper be it in riding, driving, ranch work or demonstration venues. 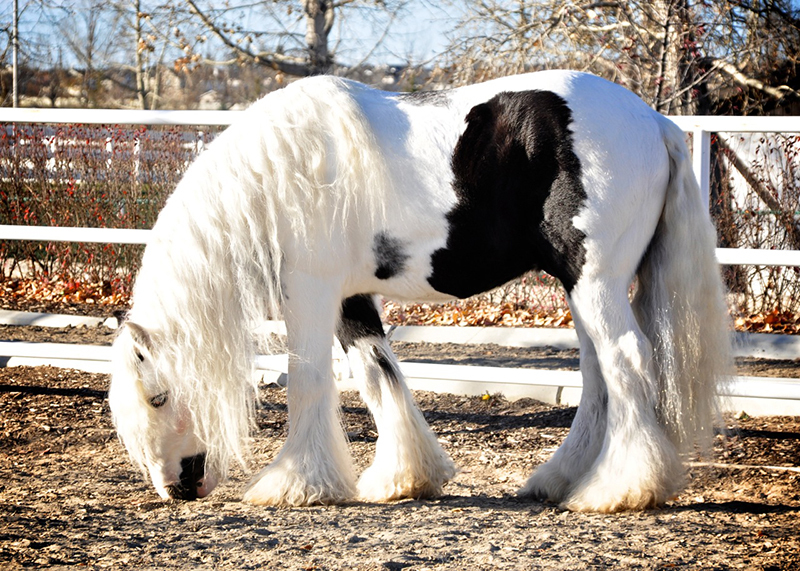 In 2014 North Fork elected to geld Tully and dedicate him fully to showcasing the breed as anchor for Team Gypsy Vanner. 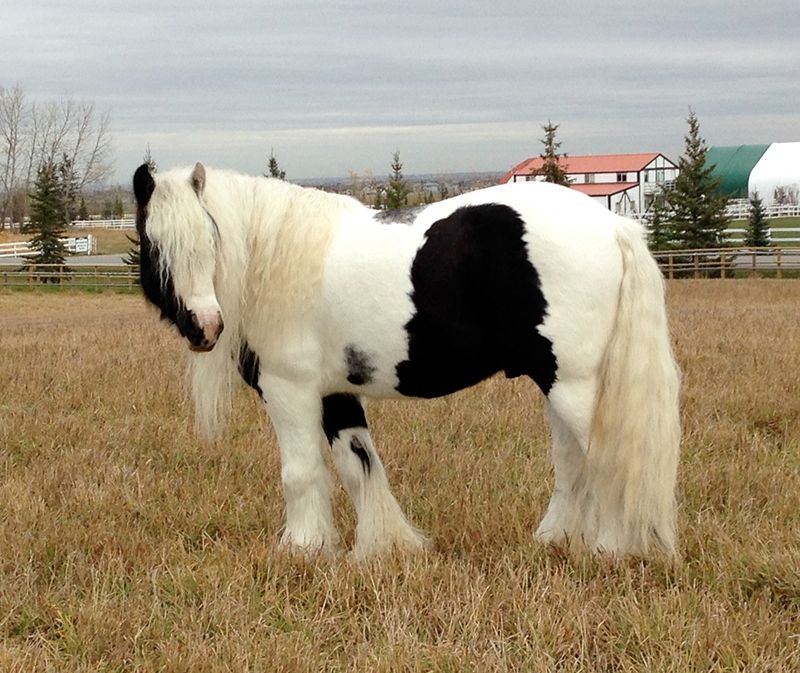 Equal in their volume of mane, tail and feather, Tully and Lioness were immediately started on driving training with Jackie Johnson to assess their suitability as a pair for Spruce Meadows. Lioness came back from her job as a proven broodmare and lightly ridden mount and adapted quickly to being driven. 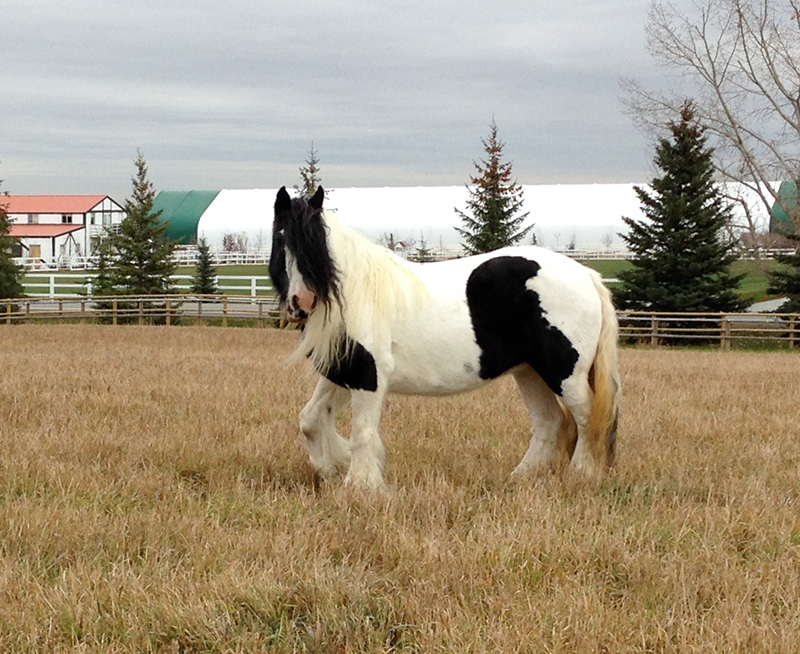 Tully started into training with Lioness a week later, and by the end of week two there was no doubt they were eminently suitable for Spruce Meadows. Tully and Lioness played off each other’s strengths and quickly became a tight pair both in and out of harness, and Spruce Meadows agreed they were the perfect team. 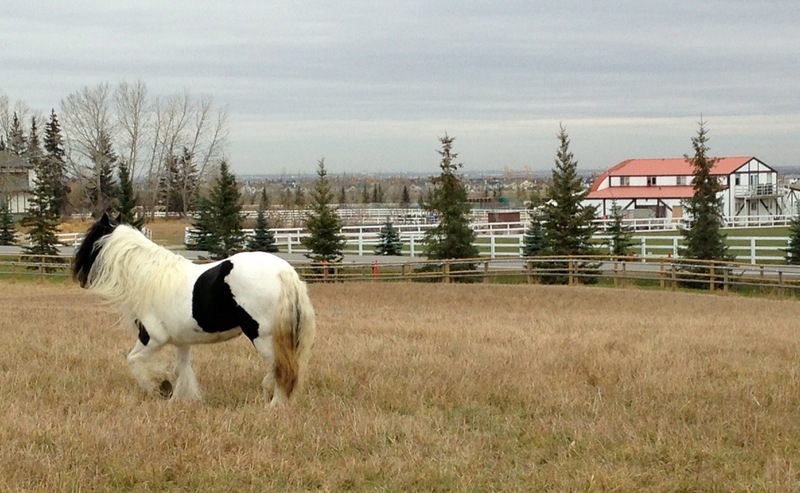 On October 24th, 2014, Tully and Lioness were delivered to their new home at Spruce Meadows. 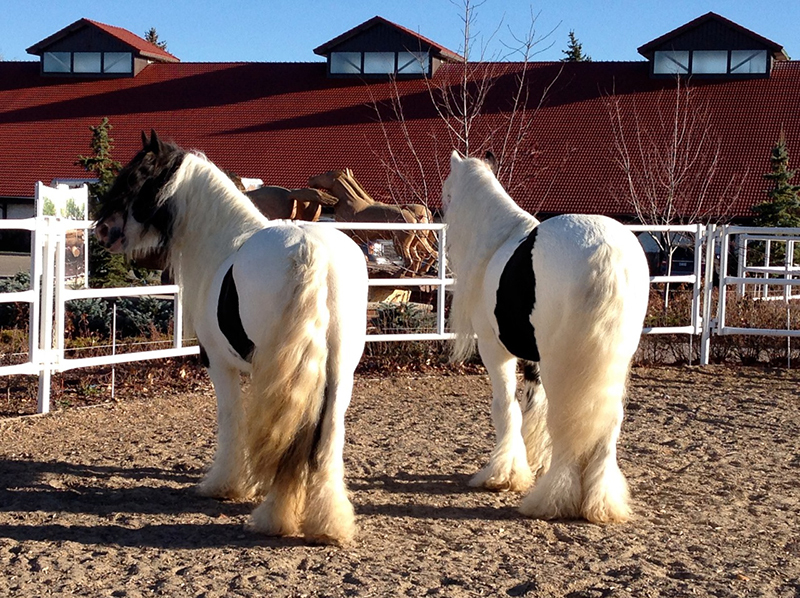 The implications of a world-class facility such as Spruce Meadows wanting to showcase and promote this breed in and around their facility are immense. 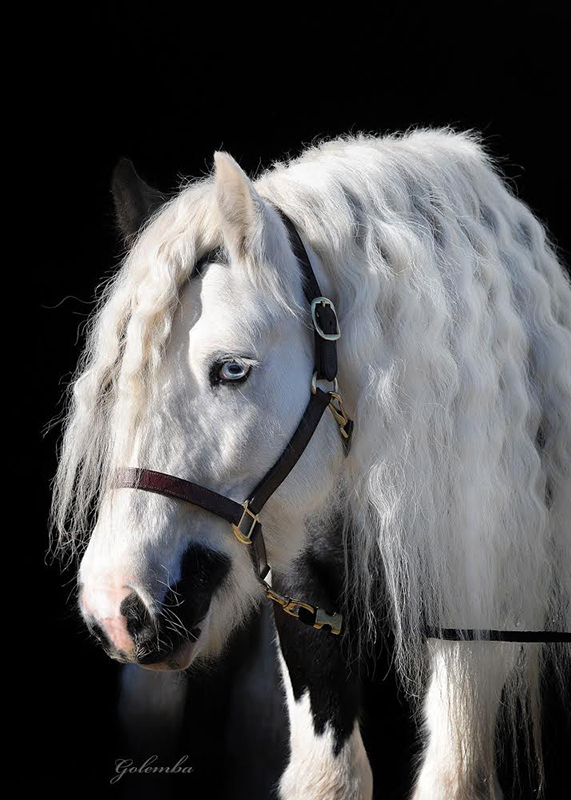 Their stamp of approval is a validation of what all Gypsy owners already know, that they are unique among all horses in the world, versatile in multiple disciplines, and that their incredible character and personality is matched only by their beauty. To add to the excitement, on May 25th, 2015, Lioness is due to give birth to North Fork Cash’s very first foal. 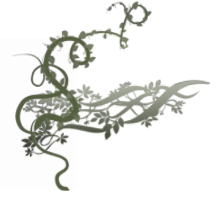 This one-of pairing is sure to be nothing short of spectacular, and the very special foal will have Tully and Lioness, the new “King and Queen of Spruce Meadows” watching over it. 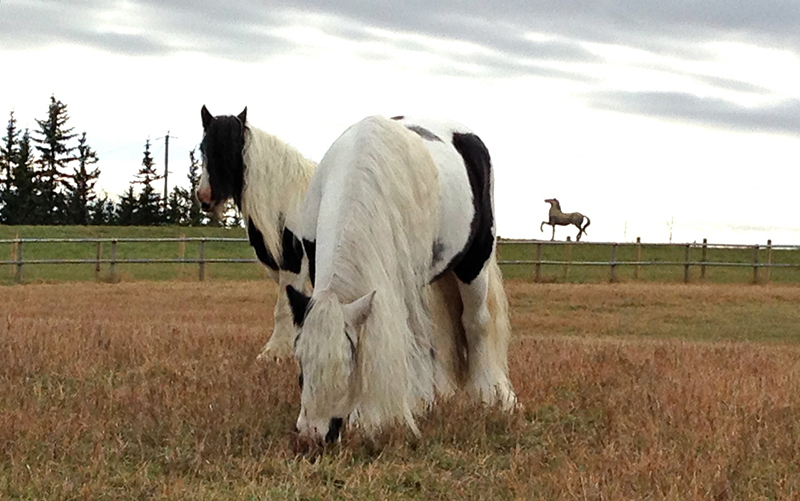 Tully and Lioness have been a key component of North Fork’s breeding program over the years. 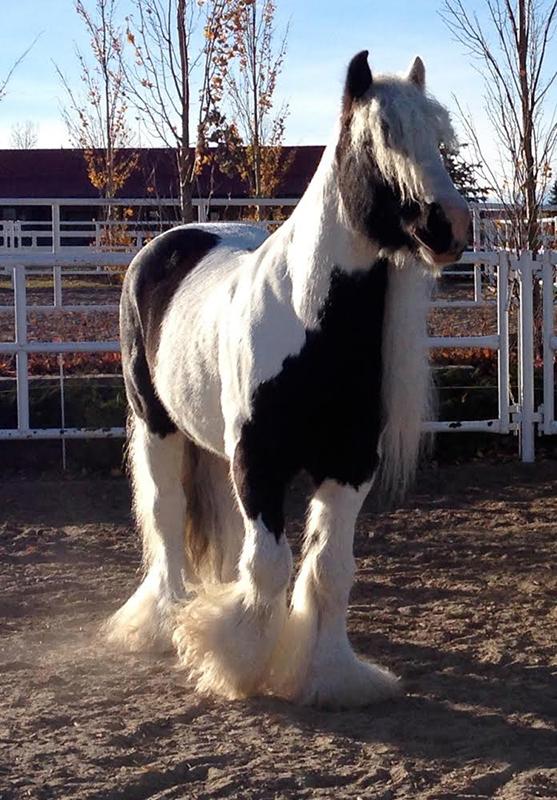 Tully will continue to be part of the program as North Fork Gypsy Cobs had him collected before being gelded in the spring of 2014. 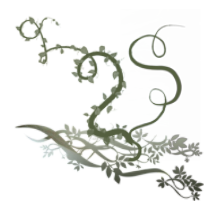 North Fork is also very fortunate to own the one and only offspring of the Tully and Lioness pairing, North Fork Hana. 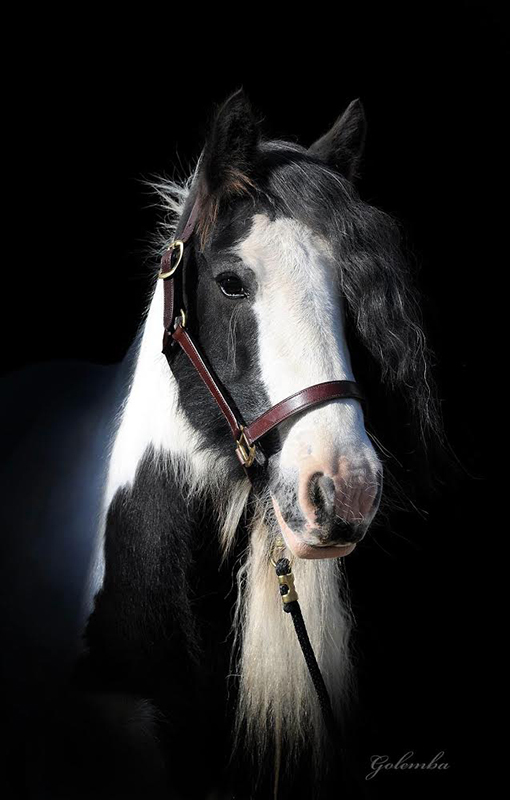 Even as a yearling, Hana promises to be simply amazing, and Dale and Cheryl look forward to watching her grow up to be a fine representative both of the breed, and her ambassador parents.